La enfermedad hidatídica es causada por un céstodo del género equinococo. Sus huéspedes intermediarios son animales herbívoros, pero los seres humanos pueden ser huéspedes accidentales. La enfermedad hidatídica es endémica en algunas partes de América, Australia, la región mediterránea, Asia central, y Europa central y oriental. Los órganos más frecuentemente afectados por los equinococos son el hígado y los pulmones. Es raro un compromiso primario del esqueleto es rara. Se han reportado casos en las vértebras, pelvis, húmero y fémur. La localización de los quistes hidatídicos en la tibia, raramente se describe en la literatura médica. Aquí reportamos un caso de quiste hidatídico primario de la tibia acompañado de fractura patológica simulando una lesión quística benigna del hueso. El diagnóstico de la enfermedad hidatídica ósea no fue sospechado preoperatoriamente. Este caso destaca la importancia de considerar la hidatidosis en el diagnóstico diferencial de las lesiones óseas quísticas, especialmente en individuos procedentes de regiones donde la enfermedad es endémica. Osseous hydatid disease is caused by the parasitic tapeworm Echinococcus. The species most responsible for hydatid disease is Echinococcus granulosus, endemic especially in sheep-rearing districts like Mediterranen countries and Australia. Bone hydatidosis is rare, making up 0.5% to 4% of all cases (1-4). 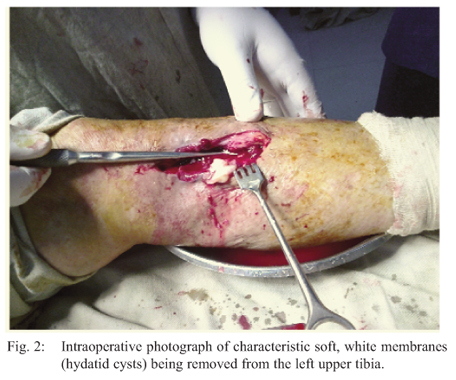 The location of hydatid cysts in the tibia has been rarely described in the medical literature. Patients usually present with pain, swelling, or pathological fracture. There are no specific radiographic signs in the affected bone. In the later stages, lytic lesions with a trabeculated pattern, with or without sclerosis, may be seen (1, 5). Computed tomography (CT) is still the best method for diagnosis and post-therapy follow-up of osseous hydatidosis. On CT, skeletal cystic hydatidosis appears as one or several closely related, well-defined, osteolytic lesions. There may be bone expansion, cortical thinning, cortical destruction, sclerosis, honeycomb appearance and extension into adjacent soft tissues (6). The differential diagnosis includes infectious pathologies, especially tuberculosis and tumours. With long bone localization, the differential diagnosis includes chronic osteomyelitis, fibrous dysplasia of bone, osteosarcoma and cystic benign lesions. The presence of periosteal reaction, osteocondensation, calcification and clear delimitation of the lesions allows elimination of the diagnosis of osseous hydatidosis (7). Diagnosis of bone hydatidosis is difficult. Because of the slow evolution and indolence of the disease and the apparent good health of the patient, it must be suspected in persons living in regions with endemic hydatidosis (7). Serologic and immunologic tests generally are negative during the early stages of bone hydatidosis, and more tests are positive in the later stages (1). However, despite all diagnostic measures, it is sometimes impossible to arrive at a definitive preoperative diagnosis; thus, the diagnosis often is established only at surgery or biopsy of the lesion (7). A 70-year old female patient presented to our hospital with pain and swelling in the left lower limb after she slipped and fell in her bathroom. She was from a remote village and presented to the hospital almost a week after sustaining the trivial trauma. Examination revealed mild oedema and deformity with tenderness over the proximal part of the left leg, close to the left knee. 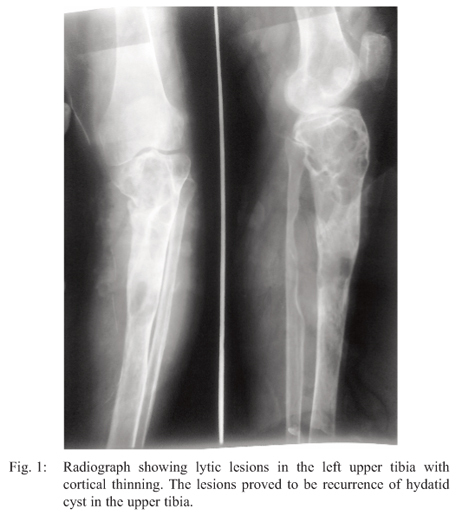 A standard radiograph showed a nondisplaced pathological fracture in the left upper tibia through small lytic lesions. It also showed cortical thinning with no soft tissue calcification. In light of the low socio-economic status of the patient, surgery was undertaken without additional radiological investigations. Surgery was done with the suspicion of a benign bone tumour/cyst or an infectious process. Curettage, grafting and fracture fixation were planned to be done at the same sitting or as a staged process. During the operation, a big multicystic lesion was seen in the metaphyseal area that extended to the diaphysis. Soft, white tissue characteristic of hydatid cyst was seen. Extensive curettage and irrigation of the bony cavity was done. Postoperatively, histopathology confirmed the diagnosis and the patient was put on albendazole (10 mg/kg/day) with the plan of doing a staged repair after chemotherapy. After about nine months of waiting, the patient had to be re-operated on when radiography showed recurrence (Fig. 1) despite chemotherapy. Characteristic soft, white daughter cysts were removed (Fig. 2) with extensive curettage and irrigation. The patient was again put on albendazole regimen and is on follow-up. Hydatid disease in bones occurs mostly in vascularized areas. The vertebra, long-bone epiphyses, ilium, skull and ribs are most frequently affected in descending order. The vertebral column is involved in approximately half of osseous patients due to porto-vertebral shunting (8). The tibia is an extremely rare site for primary hydatid disease without hepatic and pulmonary involvement. Radiological features of the osseous hydatid disease are well-defined. It produces multiloculated osteolytic lesions with cortical thinning and possible bone expansion. Marginal sclerosis, periosteal reaction and soft tissue invasion are uncommon. Periosteal reaction can be observed in case of infection. These signs are not specific, but large lesions with adjacent soft tissue calcifications are highly suggestive of hydatid disease (8). Prior to magnetic resonance imaging (MRI), CT scanning played a major role in the evaluation of osseous involvement. Calcified or uncalcified cysts may be seen with expansion and cortical thinning. Magnetic resonance imaging is the most comprehensive of all imaging modalities. The characteristic feature of this disease is the presence of multiple cysts within a cavity, which are hypointense on T1-weighted images and hyperintense on T2-weighted images. The MRI should be the choice of evaluation in order to appreciate the extent of the disease and determine surgical planning (9). The radiological appearance of the hydatid disease in bone is not specific and mimics tumours and other inflammatory conditions. Solitary lesions in bone can be mistaken for a plasmacytoma, a simple bone cyst or a brown tumour of hyperparathyroidism. A botryoid configuration of the cysts could resemble a chondromyxoid fibroma or skeletal metastasis. A soft tissue component adjacent to a lytic bone lesion would raise the differential of a chondrosarcoma, osteomyelitis (pyogenic/tuberculous) or a giant cell tumour or an aneurysmal bone cyst. An infiltrative pattern of lucencies simulates multiple myeloma. Fibrous dysplasia can closely resemble long-standing cases of hydatidosis in which the marrow cavity is extensively invaded by the parasite as in the index case. A conclusive diagnosis of hydatidosis could be reached in only half of the cases preoperatively (8). Serologic tests are valuable when they are positive but they are usually false negative for osseous hydatidosis. Complete reliance on the serology is not recommended for exact diagnosis (1). As we determined the diagnosis from histo-pathological examination, serologic tests were unnecessary. Complete cure of the osseous involvement is a therapeutic challenge. The disease generally is not curable and recurrence is likely. Surgery is the treatment of choice in osseous echinococcosis, although it can only eliminate the macroscopic cysts and local recurrence is reported in half of patients. Treatment should include a combination of surgery and chemotherapy with albendazole. Osseous hydatid disease behaves like a locally aggressive relapsing bone tumour (1). Skeletal tumour treatment strategies such as reconstruction are good alternatives in long bone involvement (8). However, when the lesion is diffused rather than situated on a segment, it is impossible to preserve the extremity. The diagnosis of primary bony hydatidosis is difficult. It may be easily overlooked and usually requires a high index of suspicion. In endemic areas such as in Kashmir, India, hydatid disease should be considered in the differential diagnosis of any cystic lesions of bones. Preoperative diagnosis is essential for correct surgical planning and prevention of recurrence, especially in a setting like ours where far-flung areas and low socio-economic status are practical problems in patient care and follow-up. 1. Arazi M, Erikoglu M, Odev K, Memik R, Ozdemir M. Primary echinococcus infestation of the bone and muscles. Clin Orthop Relat Res 2005; (432): 234-41. 2. Govender TS, Aslam M, Parbhoo A, Corr P. Hydatid disease of the spine. A long term follow up after surgical treatment. Clin Orthop Relat Res 2000; (378): 143-7. 3. Karaman U, Miman O, Kara M, Giciki Y, Aycan OM, Atambay M. Hydatid cyst prevalence in the region of Kars. Turkiye Parazitol Derg 2005; 29: 238-40. 4. Uzel M, Yorgancigil E, Aksu S, Yildiz M, Veral A, Oztoprak I. Skeletal muscle hydatidosis in the forearm: an unusual location. Orthopedics 2006; 29: 642-4. 5. Szypryt EP, Morris DL, Mulholland RC. Combined chemotherapy and surgery for hydatid bone disease. J Bone Joint Surg Br 1987; 69: 141-4. 6. Tuzun M, Hekimoglu B. CT findings in skeletal cystic echinococcosis. Acta Radiol 2002; 43: 533-8. 7. Zlitni M, Ezzaouia K, Lebib H, Karray M, Kooli M, Mestiri M. Hydatid cyst of bone: diagnosis and treatment. World J Surg 2001; 25: 75-82. 8. Morris BS, Madiwale CV, Garg A, Chavhan GB. Hydatid disease of bone: a mimic of other skeletal pathologies. Australas Radiol 2002; 46: 431-4. 9. Markonis A, Tavernaraki A, Papaevangelou M. Humeral hydatid cyst complicated with extraosseous involvement: a case of unusual location of echinococcosis. Eur J Radiol 2001; 37: 130-3.